He went from wearing Belfast Celtic’s hoops to serving as Ireland’s Minister for Defence. Before his death. Oscar Traynor was a 1916 veteran, former political prisoner, former government minister, President of the Football Association of Ireland and Belfast Celtic Old Bhoy, playing in the early 1900’s. 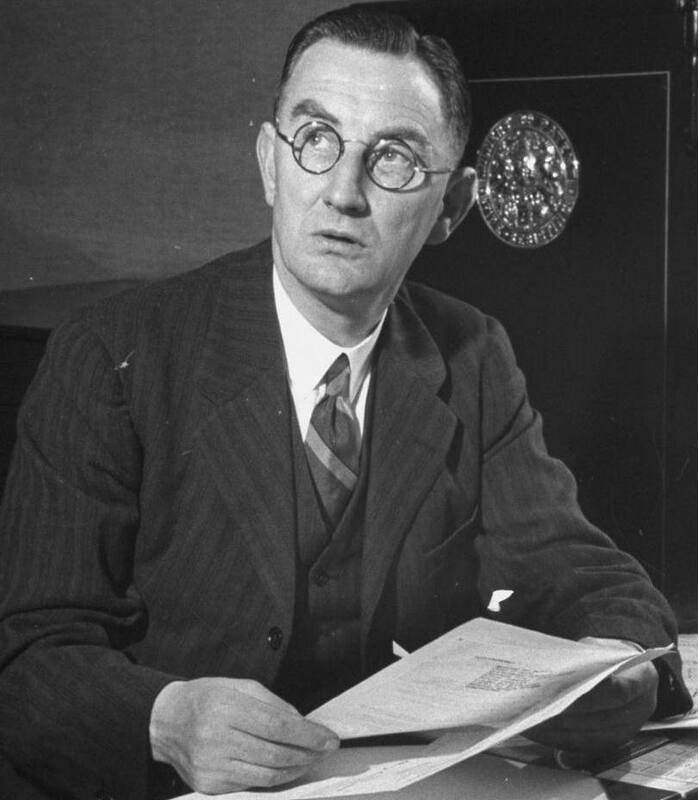 Born in north Dublin in 1886, Traynor led an incredible life. His stay with Belfast Celtic coincided with the Home Rule crisis, as Carson’s volunteers mustered on hillsides and on the horizon loomed the dreadful atmosphere of European slaughter. 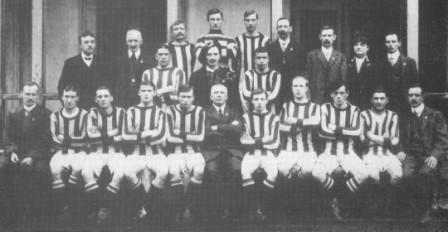 Belfast Celtic scooped the inaugural Gold Cup and Charity Cup in season 1911-12, taking trophies as the Titanic sloshed off the slipway at Queen’s Island. A record breaker, the 3-0 Charity Cup win against Cliftonville raised an incredible £166 for good causes. Second string football was also delivering success, as Celtic’s reserves lifted the Steel and Sons cup, beating Glentoran 3-1. And so Celtic’s directors, never short of ideas, took the team to Europe – the first time a club from these islands toured foreign shores. And it was a success, as Belfast’s ‘Stripes’ won five games in the central European city of Prague, drawing the sixth. It still rankles that in Celtic’s drawn game, the referee never left the corner flag area, denying Celtic six of the best! Between the sticks was the dependable Oscar Traynor, with fellow Dubliner Louis Crowe joining him in the side at Centre Forward. A team picture snapped in the current capitol of the Czech Republic shows Traynor at the top of the group in a different jersey to his team mates - normal for any goalkeeper. Except, this jersey was significant - it was the Hoops, more associated with Celtic’s Glasgow cousins, making Traynor the first Belfast Celt to wear the famous jersey now known around the world. Sadly, just four years later, he found himself not between the sticks, but behind the wire. 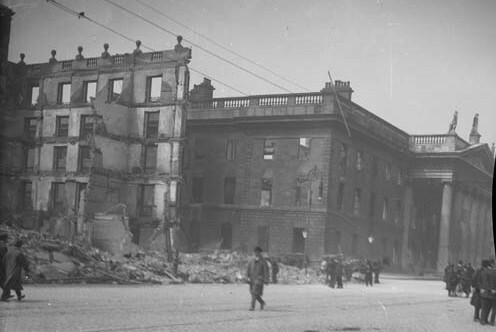 As barricades rose in Dublin and Pearse read the Proclamation at the GPO, a column under the command of Traynor occupied the strategically important Metropole Hotel on O’Connell Street. The rising’s generals had identified him as a leader, assigning him to capture a key city building. Before Easter 1916, he was tackling strikers from Linfield and Distillery – now Traynor was tackling the British Empire! 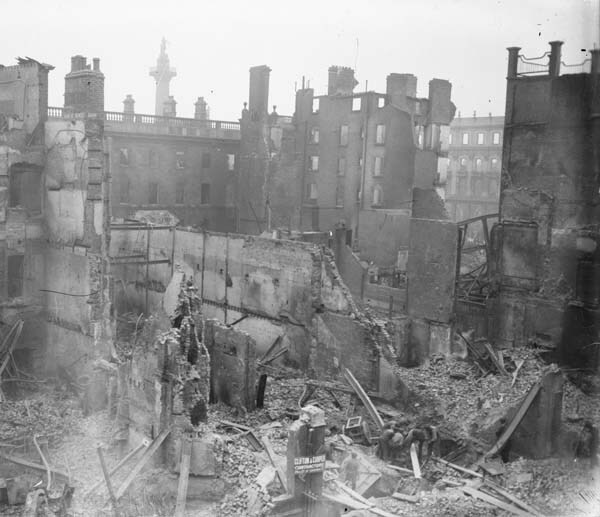 Traynor tried to tell others of the spreading fire, revealing; "Before that happened those of us in the Metropole made tremendous efforts to warn the garrison in the Imperial Hotel of the grave danger which menaced them. “If our messages, which were sent by semaphore, were understood they do not appear to have been acted on, as the eventual evacuation of the Imperial Hotel appears to have been a rather hurried one.” Harrowingly, he remembered; “…seeing the huge plate-glass windows of Clery's stores run molten into the channel from the terrific heat." As the rebels surrendered, Traynor was frog marched to prison and transported to the desolate Welsh hamlet of Frongoch - interned in a dreary prison camp Sport was shelved as Traynor was immersed in the national struggle and on his release he led the IRA’s Dublin Brigade, working with Michael Collins. As the Treaty negotiations crystallized in London in spring 1922, Traynor found himself at odds with his old ally Collins, joining the Republican forces committed to removing the new détente with Britain. In the war’s climax, Collins ordered the shelling of the Republican Four Courts garrison, with borrowed British artillery, asserting the muscles of the new Free State. As English shells again peppered the city, Traynor and his men again occupied O’Connell Street, where they’d fought the British just six years before. 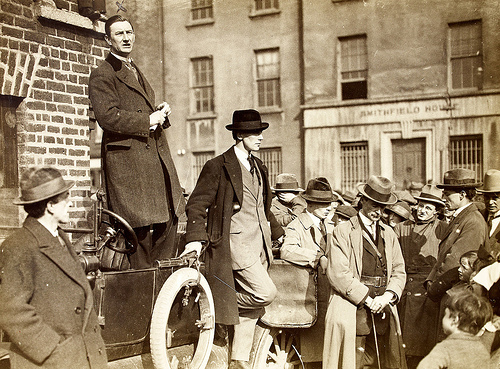 After a week of fierce fighting, when Cathal Brugha made his final stand, he led his men south, organizing guerilla actions in South Dublin and Wicklow, before capture and imprisonment for the rest of the war. On release, he followed De Valera into Fianna Fail and held cabinet portfolios for Justice, Posts and Telegraphs, and appropriately for a goalkeeper, Defence! But football, was in his heart and in 1948, after leaving the Defence Ministry, he was made President – not of his country – but of the Football Association of Ireland – remaining until his death, aged 77, in 1963. And he left other sporting legacies too. In his old constituency, Oscar Traynor Road is a major arterial route bordering Artane, Coolock, Darndale and Donaghmede – areas filled with Celtic fans. There sits the Oscar Traynor Centre, a key sporting facility for Dublin’s north side citizens. Pass by the pitches at Coolock any weekend and you’ll see dozens of well-togged teams – many clad in Celtic’s hoops. Also, the Oscar Traynor Trophy is one of the biggest junior football tournaments on these islands. Declan Smith from the Oscar Traynor Centre explained:“This competition is held in his honour every year. “Teams compete from Donegal to Cork in areas covered by the Football Association of Ireland and, with representative sides drawn from every amateur league, it’s a who’s who of Irish junior football – a really big deal." 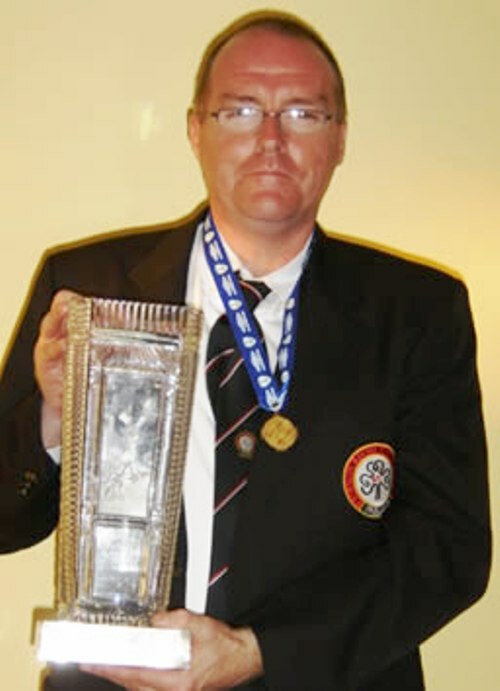 “The amateur football league based here won it two years ago and it was very special to bring the beautiful Waterford Crystal vase back to the Oscar Traynor Centre.” So from wearing the Hoops in Belfast to facilitating footballers on the meadows of north Dublin – with prisons, protests and party politics in between – the case for Belfast Celtic’s Minister for Defence is as strong as it was a century ago.